J Davidson merchandise is the ideal gift for truck aficionados, and there’s something for everyone regardless of your budget. Christmas is fast approaching, but with delivery usually within five working days via Royal Mail, there’s still time – just remember to leave extra time for delivery once the big day itself is getting very close, as there will be an awful lot of parcels being sent around the country in late December. Lots of J Davidson merchandise is especially suited to being given in the winter months too, such as our limited edition golf umbrella (we only have 50 of these, so if you wait too long to order, there’s a good chance you’ll miss out). There’s a whole range of hoodies too, including kids’ sizes, so you can dress the little truckers in your life from the age of around 3 years upwards. For the smallest of budgets, we have a selection of stickers – and everything is sent out by 2nd class Royal Mail parcel postage and charged at cost price, so we don’t make any money out of the price of delivery, it’s as economical as possible for you as the customer. There are other great gift ideas too, and right now our range of J Davidson merchandise includes A3 2015 wall calendars, ceramic mugs with wraparound imagery of our trucks, and baseball caps that feature the J Davidson company logo. All in all, you can get a good gift for not much more than a fiver plus cost-price delivery, or splash out a little extra on some of our great range of clothing. We’ve already mentioned the hoodies earlier in this article, but it’s the T-shirts that will really grab the attention of anyone who loves our branded movie-themed trucks. Our Die Hard, James Bond and Terminator cabs pay homage to some of the greatest action movie franchises of all time, and now you can do the same by getting your hands on a matching T-shirt in black or white and a range of sizes. Each has its own tongue-in-cheek motto printed above the picture of our truck – Bond gets ‘Licence to Scrap’, Terminator has ‘We’ll Be Back’, and our personal favourite is the Die Hard T-shirt’s ‘Yippee Ki Yay, Mother Trucker’. 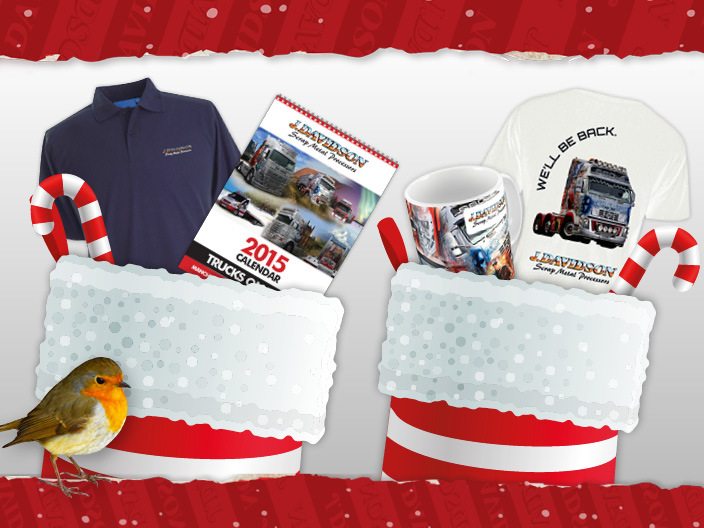 They’re fun and fashionable too, making them – and all J Davidson merchandise, in fact – the kind of gift any true trucking aficionado will be delighted to unwrap on Christmas morning, or at any other time of year. You can take a look at our range here, for more information call us on 0161 928 9981. This article was posted in Merchandise. Bookmark the permalink. Follow comments with the RSS feed for this post.Both comments and trackbacks are closed.